We have quite a few barre class options in and around Madison. I've thought about trying out a class, especially when they all seem to offer a free demo here and there, but I just never do. Part of that reason? 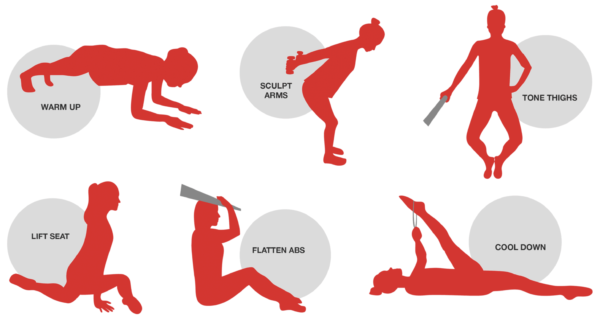 What is barre? Is it ballet (I tried that... I'm no ballerina)? Is it similar? Is it aerobic or strength training? What the heck is it? And so I don't try it. So... along comes Abby and asks if she can write something for us that will give people like me, who are clueless about what barre might do for us, an idea of what a beginner really needs to know. So... if you've ever driven past a barre studio and thought "I should try that sometime", here's what you need to know! You've done it, you've decided to see what all the hype is about and take your first barre class! But, with your workout gear in your bag and your class time quickly approaching, you realize you have no idea what's in store. Don't worry, here is a 7 step guide to help you make your first class a great one. Barre class is based on the movements of ballerinas and you will be using the ballet barre, but it is not a ballet dancing class. Barre classes incorporate Pilates, yoga, strength training, and some dancing into every routine to make sure all of your muscles are thoroughly worked. That means though some classes can be set to music, expect more from your class than a cardio boost for the day. There are deep stretches, repetitive movements, and weighted exercises involved as well that will have you feeling every single muscle by the time you leave. When you go into this class, please remember that you are not a ballerina (unless you are). So, you will likely see movements you have never seen before, hear terminology you've never heard before, and work muscles you never knew existed. You probably have no idea how to properly plié or how to balance yourself against a ballet barre. You may not be very graceful in your first class and you may get tired before you are finished, but don't give up. You will get better with time and practice. Pay close attention to what the instructor and other classmates are doing and make sure your movements match. If you don't know something, ask for help. Your form is very important in barre class, so make sure you are wearing clothes that allow you to move freely without being weighed down. Barre class may not be the best class to wear your baggy basketball shorts or jogging pants even if they are comfy. You do not necessarily have to wear a leotard, but well fitting clothing designed specifically for working out is recommended. You should be able to clearly see what your body is doing and so should your instructor. Some barre classes are done barefoot or in normal socks, but make sure to double check with your studio and see if special socks with grips on the bottom are required. Since this will be your first class it is a good idea to arrive early and make a friend or two. Having a familiar face to look to when you want to check your moves or need a little moral support will greatly enhance your experience. The instructor is a good ally to have as well. Explain to them that you are new and they can give you tips before class and keep a special eye on you throughout to make sure you are keeping up. You will be doing a lot of small movements that target very specific muscles in class that probably have never been exercised much before. These newly awakened muscles will definitely hurt. Even the more familiar muscles like the hamstrings and calves will hurt much more than normal since barre is focused on tiny repetitive movements designed to exhaust the muscles. If you begin shaking or feel more pain than you're used to during class, you are probably doing something right. It is important to properly fuel your body before coming to class. A good meal should include complex carbohydrates for slow burning energy and protein. Just like any other workout, bring water to stay hydrated during class as you will likely sweat and do not want to become weak. Speaking of sweat, wear a sweat band if you tend to get sweat in your eyes and bring a towel if your hands get sweaty. Be sure to stretch after class to help your muscles heal and get you feeling good for your next session. 7 - Come Back For More! If you add barre to your normal workout routine, you will definitely see results. After a few months, you will begin to gain strength, tone, flexibility and lose inches. If you are not too fond of your first class, go to another. Every studio is a little different, but the benefits are the same. Abby Drexler is a contributing writer and media specialist for Pure Barre. She regularly produces content for a variety of health and fitness blogs.